It was Ironman bike day, when the athletes have the option to ride up to 180K around the island (or even a little more), and this time the weather was perfect. Prospects were good. Last week I’d turned athletes home at Jonnies Bakes in Teguise, 130K into the ride; this week I expected to send most of them on to Mirador del Rio. While a few left early the bulk of the athletes left at the regular 9am (or just after due to minor bike issues). Gill and I would be spending the day in the mobile aid station (hire car). 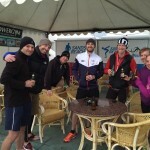 Forty-five minutes after the athletes left we headed straight for Puerto Callero for the first aid stop. We just missed the fastest riders, but the main group, working well together, only trailed 20 minutes behind. Barely 2 hours into the ride it was a very quick stop. Water topped up and athletes back on the road we drove on to Yaiza. It’s the longest break in the day for the support crew so we relaxed and had a coffee while we waited. Around 11am the first cyclists arrived. Temperatures were rising so plenty of fluids were needed; my ice cream refuelling strategy also came into play, both for me and a few of the athletes. 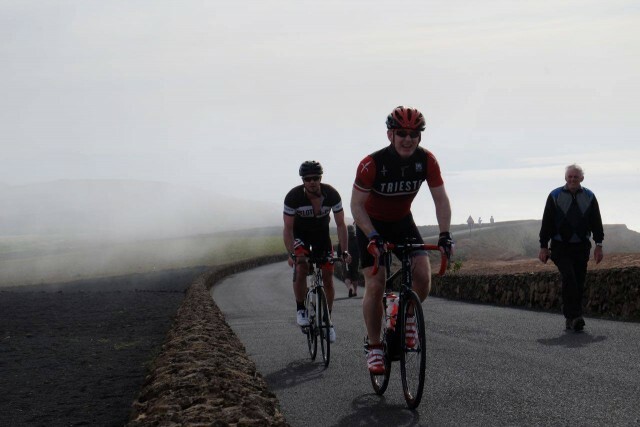 Simon and George were riding strongly having added in a trip over Femes, down to Playa Blanca and around El Golfo and still reached Yaiza ahead of the main group. After a brief stop to resupply they pushed on. On the other hand the main group had hit a snag when one of their number, Andy, completely bonked. David towed him into town and we did our best to refuel him and get him back on the bike. Despite our best efforts he was gone. No more than 100m out of the coffee shop it was obvious he wouldn’t be able to ride any further. Fortunately the support crew were on hand and we quickly had him and his bike in the back of the car. Andy’s been feeling under-the-weather over the last week and the long ride was just a step too far. 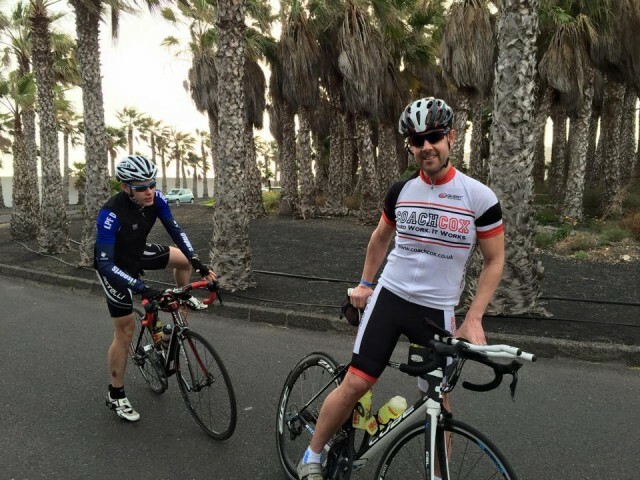 There was a quick water stop in La Santa for the rest of the group before we sped up to Jonnies Bakes in Teguise catching the faster riders finishing off their coffees and cakes. They were making such good time we decided to leave them to it and focus our attention on the main group of riders. They made it in Jonnies just as it closed – no coffees for them, but a large plate of free pastries instead! With only one pack to support our job became much easier. 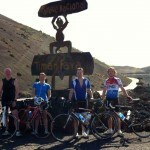 We rolled with them, stopping at the top of Haria for a quick refuel and again at Mirador del Rio. From there it was an easy ride home so with everyone topped up we headed straight back to the hotel. 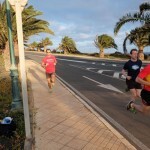 I’m pleased that all the athletes got to push themselves and see so much of the island. Many completed the full route a couple added in Playa Blanca and Orzola for an even bigger ride. There was some suffering out on the road, Andy’s bonk only one part of that, but everyone performed well.